Over my middle school and high-school years, I must have repeated that 5-step morning ritual close to 1000 times. For many of my fellow “80’s babies” out there, Saved by the Bell (SBTB) was an instrumental part in (mis)shaping expectations of what life was like in high school. The reality is that looking back on the show now, it really did little else but highlight some social stereotypes and mix in a few “after school special” lessons – but, to be sure, the “truth” of high school doesn’t always go down as well with a bowl of cereal in the morning. The theme of pivoting is sprinkled throughout the entire episode. Pivoting, in this case, is finding a way to course-correct your current business or product approach into a newer and better one (or, in SBTB terms it’s like a Zack Morris timeout + repositioning the frozen characters + setting the scene off in a new direction.) In the episode, we see our first pivot occur when the team initially splits up and forms two competing companies. 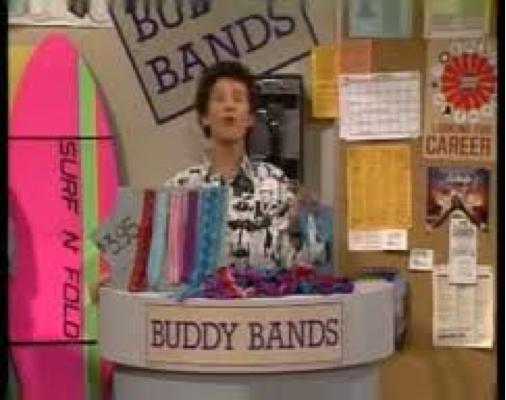 On the one hand you have the original product, Friendship Bracelets, and the other you have “Buddy Bands” – slightly different in their execution but both still satisfying the same market need. We see the next pivot occur after the new competition starts outperforming the original product in sales. In response, Zack, Lisa and (albeit reluctantly) Screech decide to offer a special deal that includes “a friend for an hour” with each purchase who will carry your books to class or do crazy dances with you in the local diner. The final pivot happens when the two teams mend broken friendships and decide to merge the two products together to create a new concept called “Lovecuffs.”- Pretty deep business philosophy for a 1980’s comedic sitcom involving high-schoolers, right? Now fast-forward to 2012. Hailed by many as a sort of Entrepreneur’s Bible, Eric Ries’ 2011 best selling book “The Lean Startup” is still sending ripples throughout the startup world. Among many of the book’s redeeming lessons for founders, it discusses at length the concept of continuous innovation via pivoting. While pivoting has certainly been a component of business strategy that predates even SBTB, it hasn’t been until recently that droves of entrepreneurs are taking this message as gospel and have begun vehemently implementing it in their approach to growth – so much so that “pivot” is quickly becoming that overused, flavor-of-the-month buzzword which people begin cringing at as if they had just heard the Macarana come up on the radio. A cool product is only as good as the content you can create to introduce it. Our friends at SBTB recognized this when A.C. (no relation), Kelly and Jessie all left Friendship Forever to start a competing business. After the split happened, their first step was to pull the PR momentum away from Friendship Bracelets and focus it on their new Buddy Bands product. So, the team donned their headbands and delivered a choreographed 80’s dance/music video highlighting their launch (which included some of those awesomely-weird technicolor treatments.) By showing this video in class, the team was able to immediately draw in potential buyers and announce to everyone that there were new players in the market. Look at how entrepreneurs approach leveraging video in 2012. Every week it seems that there is a new viral message being emailed, tweeted or discussed that was delivered from some crazy video clip created by a new group emerging in the startup space. The entrepreneurial masses have spoken – when it comes to making a splash, they’ve agreed that only using a website, mission statements or even business plans to court new investors/users/partners is soooooooo 1990. There are countless examples of how effective these video campaigns are at getting new companies in front of the right audience and quickly delivering their own value proposition. Most recently we have the web gem brought to us by DollarShaveClub.com – a video that was so successful that it actually crashed the company’s website because of too many visitors. Other examples include Groupon’s “how-it-works” video featuring hand-drawn characters; or what about Foursquare and Spotify’s video barrage? All of them were met with a fresh appreciation for the way they introduced their companies and arguably played a role in setting them on the path of success they are currently enjoying. While not everyone will be able to achieve the same results as these companies, 2012 is showing us that videos are a great medium for entrepreneurs to get reacquainted with and begin using to talk about their vision, describe their products and give buyers a sense of what they are all about. Mark Zuckerberg – nerd. Andrew Mason – at least nerdish. Reid Hoffman – coke-bottle classes. Evan Williams – vegetarian, which is sort of nerdy. The list above goes on and on and on. In 2012 it is pretty clear that the nerds are the one’s holding all of the chips in the tech venture world. The biggest IPOs, the most fruitful exits and some of the hottest products coming to market are being steered by those same people who fit nerd stereotypes all too well. It wasn’t that long ago that the pendulum was on the other side of the scale – with the biggest gains being made by the most connected and affluent people who also happened to (typically) be wealthy, articulate and had the resume experience which afforded them a higher level of business pedigree. To be sure, these other non-nerd types are still making a mark, but they are not nearly as prevalent of a player as their pure-nerd counterparts. While this trend has been growing for some time, recent successes are driving a bonanza of new entrants who are coming into the game to stake their own claims on a piece of the nerd kingdom being built. As SBTB correctly predicted, new businesses aren’t being born out of locker-room chats in private member clubs, but instead from online forums, hack-a-thon meetups or perhaps even while doing some big quest with a team on World of Warcraft.